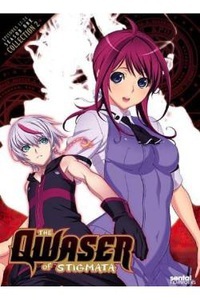 The relationship between a Qwaser and his Maria, the woman who provides him with the sustaining soma that he needs to fuel his elemental powers, is already a strange and twisted one, but as the battle for the High Circuit escalates to a insane crescendo, a completely unexpected question arises: can exposure to beings with superpowers actually be contagious? The answer could prove deadly as Miyuri goes through a most unexpected transformation! Meanwhile, Mafuyu finds herself even more conflicted over her relationship with Sasha as he slowly recovers from his strange amnesia, while Elizabeth fears having to choose between Shin'ichiro and her friends. As new waves of adepts attack, the milk of human kindness alone won't be enough to nip tragedy in the bud, and the survival of each pairing may ultimately depend upon the courage within each maiden's breast!